Phi Phi The Beach Resort is located on the beachfront at Long Beach, one of the most spectacular beaches on Phi Phi Don. 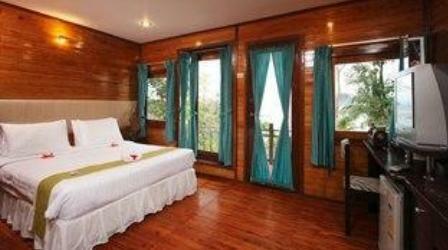 The beach resort is nestled into the hillside with views overlooking the beach, Tonsai Bay and the picturesque Phi Phi Ley. 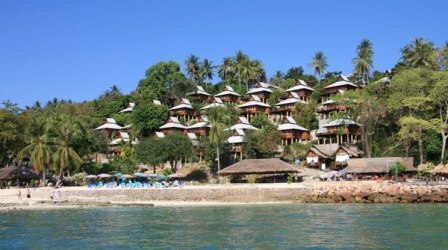 This three star beachfront resort consists of superior and deluxe hillside villas, which are made from traditional teak wood, most of the villas have beautiful ocean views. The fantastic location of this beachfront resort makes it a popular choice, click to check rates and availability. 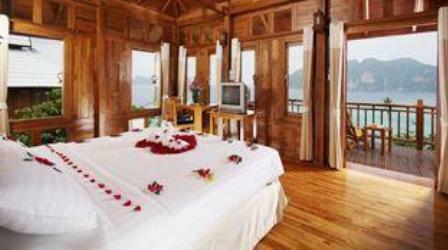 Each villa has a private balcony and air conditioning as well as a range of room amenities. 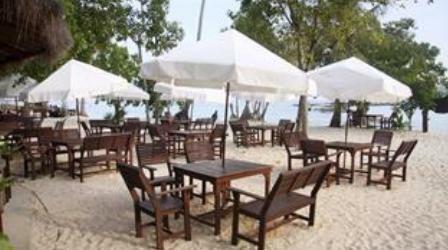 The Beach Resort has a fantastic beach bar and restaurant with a selection of Thai and Western dishes. The beach Bar is a popular spot for sunset cocktails. As you can see this beachfront resort is built on the side of the hill, guests are escorted to their villa by a golf cart on arrival and when departing. Through the day you can walk from the “Beach Resort” to Tonsai Village, the walk will take around 30 minutes each way. The walking track is pretty good, however there are parts of the track that are a bit tricky especially if it is wet. I really wouldn't attempt or recommend the walk at night, it is much safer to get a longtail boat instead, expect to pay around 100 baht one way for the boat ride. 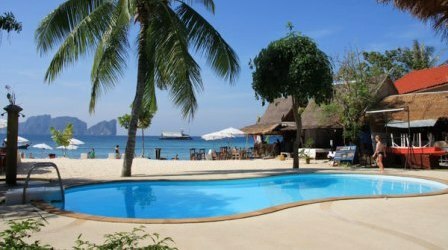 The Phi Phi Beach Resort is a very good place to stay, read reviews from other guests who booked their accommodation using Agoda. Or read what other fellow travelers have to say about their experience at the The Beach Resort on Tripadvisor.